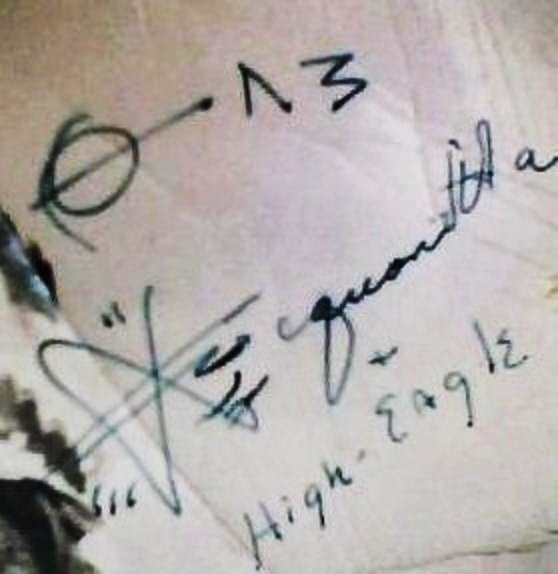 Can anyone help me identify this signature? Ft. Warren, WY. I was told that the woman in this picture had played in a old movie called: "Unconquered", and that she was visiting the fort to entertain the servicemen. 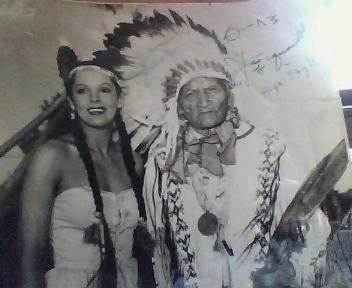 The man pictured in photo I was also told was her father and that he was a chief back then. (Do not know what tribe they had belong to). I just wanted to add that on his scarf he has three initials: J.H.E. Also on the back of photo states: photo by Harold H. Rubens. Hi walksoftly, Unfortunately I had searched the cast and I had no luck finding any name that match the signature in the photo, but thank you for your input I appreciate your kindness. I noticed the name High Eagle. 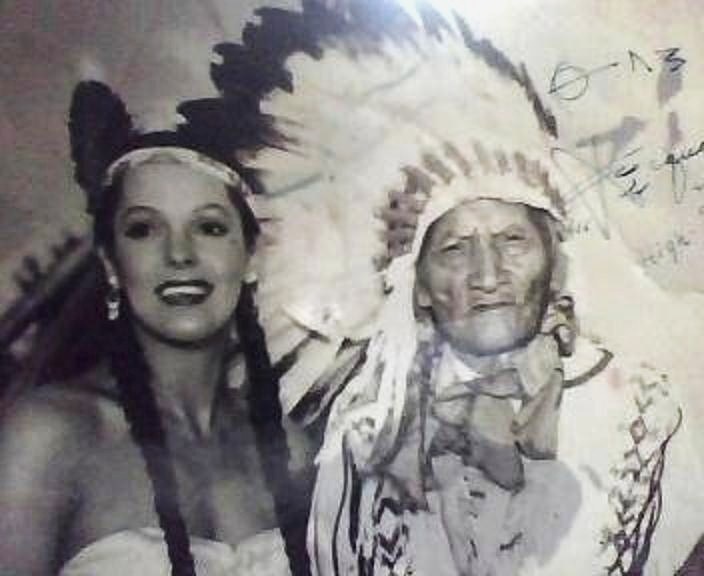 That name was given to Tim McCoy by the Arapaho tribe of the wind river reservation in Wyoming. McCoy produced both western movies and TV shows. Perhaps you could research his movies etc. and come up with the same image??? Scandinavian I know it was a while back but I was new at this, so I would like to thank you now for the love. Is it my browser, the image stays the same size when I click on them? His full name is Joseph High Eagle, Pine Ridge Indian Reservation, South Dakota. If that woman was in "Unconquered", this photo dates between 1947-1950. She appears to be dressed like a squaw. Here is a list of actresses that played squaws in that movie: Nanette Vallon, Inez Palange, Belle Mitchell, Rose Higgins, Charmienne Harker, Fernanda Eliscu, Claire Du Brey, Isabel Cooper, Maxine Chevelier & Mimi Aguglia. Most native american roles were played by non natives, so she probably isn't a daughter of High Eagle. From Pack's list Charmienne Harker is the only one that looks like her. 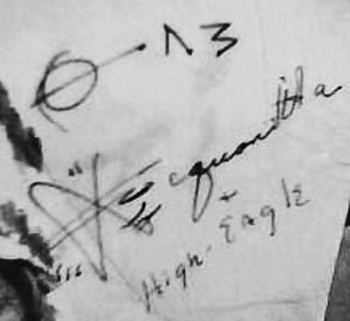 The autograph may have been a stage name, as both are dressed in "Hollywood style". Every native was a warrior or Chief for the men, and squaw or Indian Princess for the women. They may have been part of a travelling entertainment group. High Eagle was born in 1860. WOW! Unbelievable! I had it for such a long time. I would periodically spent hours and hours on the internet searching and always came up with nothing. MYSTERY IS FINALLY SOLVED!!!!! AGAIN THANK YOU!!!!!! I have been searching periodically on this since you posted it. I enjoy a mystery & the search for the answer, it always helps to have many heads working together. I am really so thrill. I just can't believe I finally know who they are. Also I think you are right about the woman being Charmienne Harker. She sure looks like her (and like you said) just autographed in her stage name. Again Thank you so much!!!! I can now have it framed. You are very welcome, love helping out. That is a great photo, and will look really nice framed. I just found out that it was in 1947-48. When my friend was on leave from the army and was station there. So once again, you were 100% right!!!! No problem, again, glad I could help. Great day to you also. Thanks again kerry, I appreciated all your love for all my things.